While the depth of writing in the new Avenging Spider-Man series reminds me of the “Reader’s Digest” version of a Spider-Man comic book (or maybe the daily newspaper comic book strip is a better comparison), there has still been some stolen moments of solid characterization and storytelling as it relates to how Spidey stacks up against the rest of the Marvel superhero universe. Through the series’ first three issues we had a Spider-Man/Red Hulk team-up that aligned brains with brawn and demonstrated that sometimes, intellect wins over brute strength. But there’s still too much of a tendency throughout the Marvel universe to portray Spider-Man as a physical underdog, especially in series such as Avengers and Fantastic Four where he’s a supporting character to the point of virtual non-existence (it’s very rare outside of his own titles for Spider-Man to “save the day” and even in Avenging #1-3, he “wins” more because of dumb luck than through hand-to-hand success). Every once in a while, I think it’s important for Marvel to remember that Spidey is in fact a pretty cool superhero, fully capable of holding his own in battle, and Avenging #4 is the first one of these team-up issues to do that. 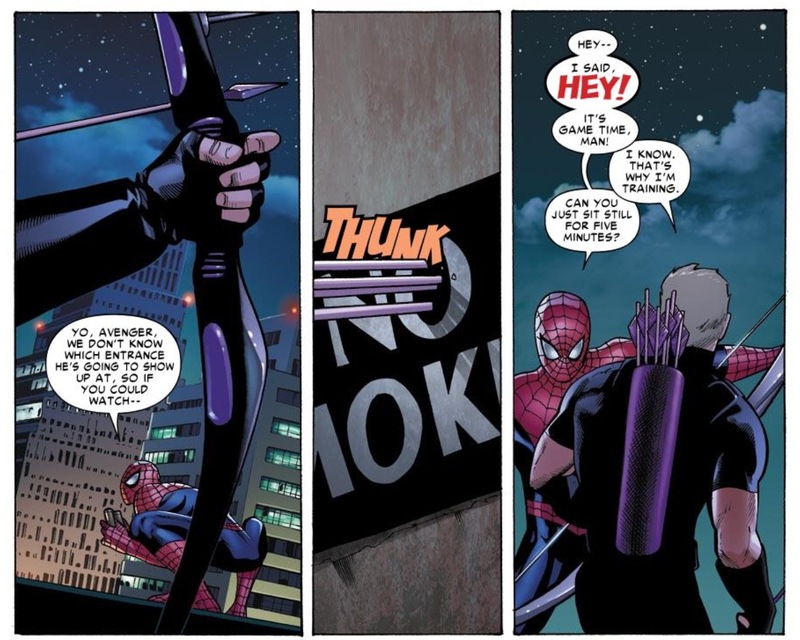 Of course, Spider-Man’s “win” comes at the expense of the non-mutant, non-radioactive archer extraordinaire Hawkeye. 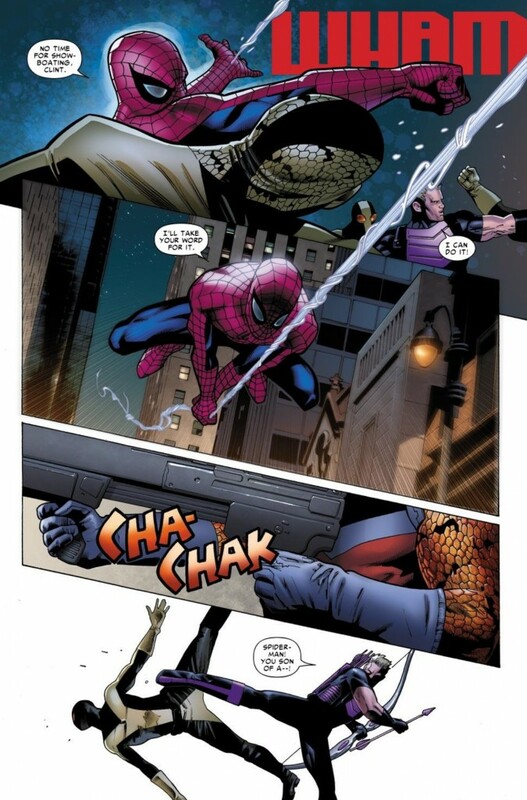 While it would have been nicer to see Spider-Man grab a brass ring that was otherwise out of reach to someone more imposing like Captain America or Iron Man that would have flown in the face of the ultimate moral of Avenging #4, which was even after success in battle, Spidey is just too gosh-darned modest to take credit for his achievements. 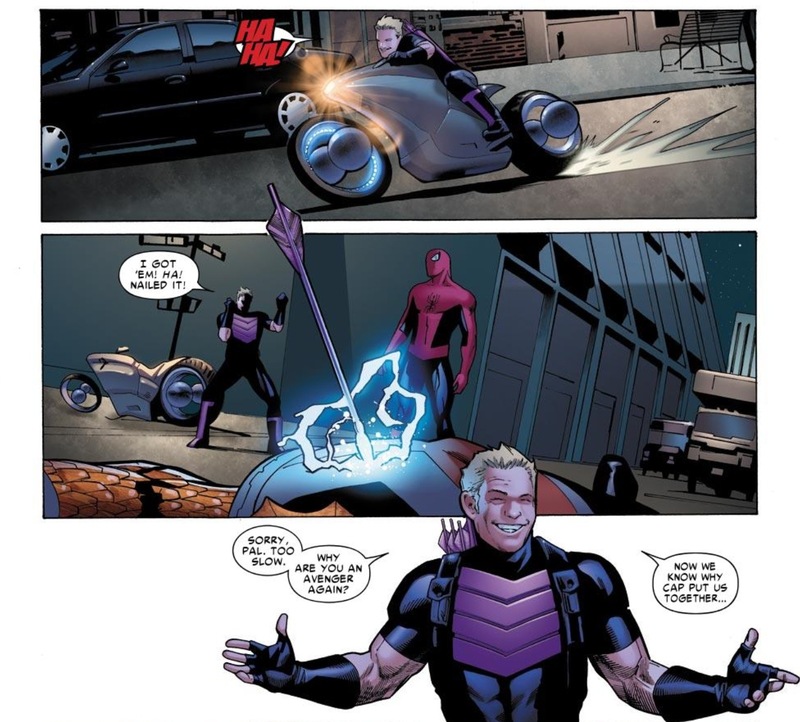 So with all that said, it was still nice to see Hawkeye attempt to hit a one-in-a-million shot with an arrow in order to disarm the villain Side-Winder and miss. 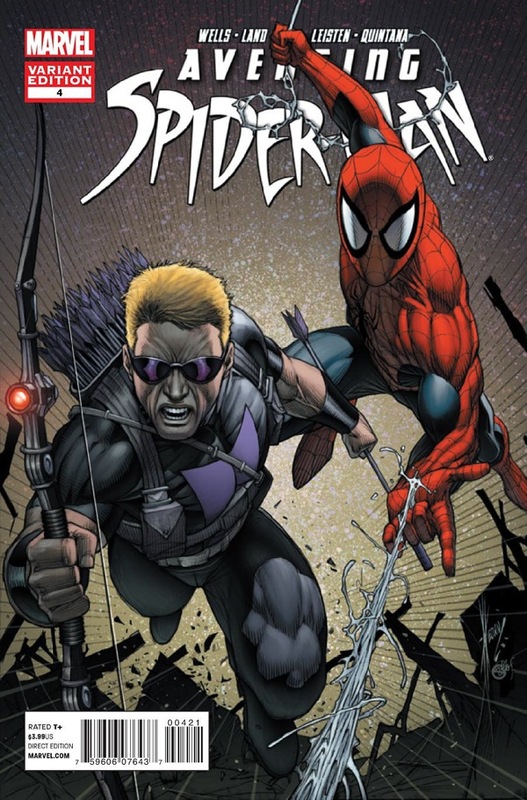 And despite the character’s general arrogance toward Spider-Man, the Web Slinger understands very easily that the non-powered Hawkeye’s career relies on making that shot. So when Spider-Man quietly dispatches of Side-Winder unbeknownst to Hawkeye, he can give the inferior “hero” the credit, since he needs it. 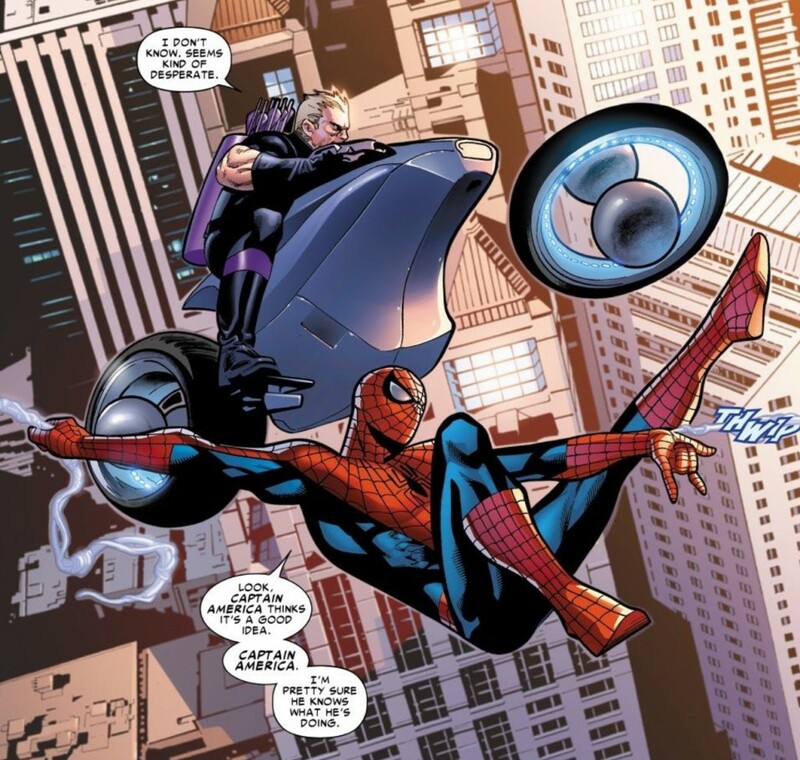 It’s quite the role reversal from previous team-up efforts in Avenging and in other series where it seems like Spider-Man is in constant need of the “rub” from Marvel’s more established heroes. In the recent Spidey/Daredevil team-up in ASM #677, Spider-Man can’t even beat the “Man Without Fear” in a race down the side of a building. Since when has the Wall Crawler lacked speed or dexterity, regardless of how Matt Murdock’s senses have been enhanced? So I guess Avenging #4 was a bit of a “bone” thrown to the contingent of Spider-Man fans who are tired of seeing their hero relegated to a “B” character who sits in the background cracking jokes and aggravating his peers. Overall, I think Avenging #4 is a really good example of what Zeb Wells can do within the “team-up” model. A simple, yet well developed one-shot story that brings out the best in both Spider-Man and someone else’s favorite character in the Marvel universe.